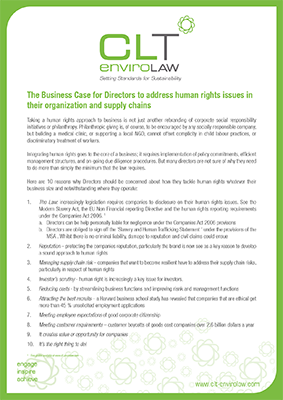 Taking a human rights approach to business is not just another rebranding of corporate social responsibility initiatives or philanthropy. Philanthropic giving is, of course, to be encouraged by any socially responsible company, but building a medical clinic, or supporting a local NGO, cannot offset complicity in child labour practices, or discriminatory treatment of workers. Integrating human rights goes to the core of a business; it requires implementation of policy commitments, efficient management structures, and on-going due diligence procedures. But many directors are not sure of why they need to do more than simply the minimum that the law requires.